Summer has arrived: sun, perspiration; heat, perspiration; gardening, perspiration–you get the drift. It’s July in Central Texas and that means heat, but it also means blooms, and plenty of them. Today is also Garden Bloggers’ Bloom Day and I’m thanking Carol at May Dreams Gardens for hosting this monthly tribute to blooms in the garden. The pond cools my gardens and it’s at its best during the summer months. 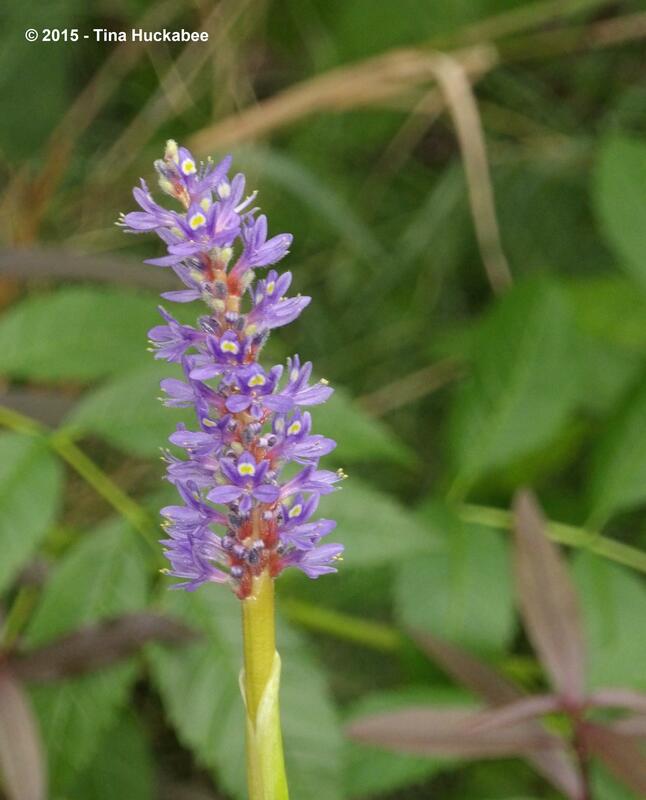 This native Pickerel Rush, Pontederia cordata, spikes purple flowers, each lasting for days. …and afterwards. Pickerel Rush likes shallow water and this one is planted in the bog section of my pond. 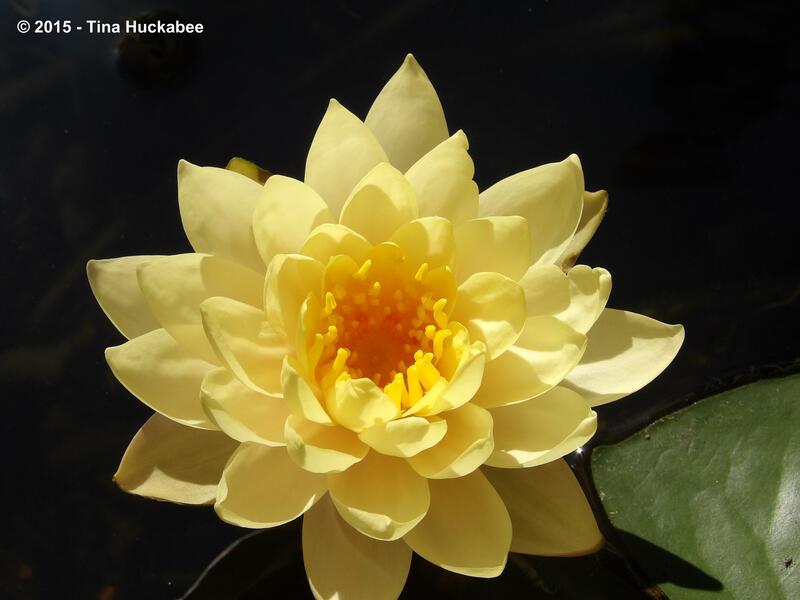 This Claude Ikins water-lily graces the pond with cheery yellow flowers. When I’m standing in the water for some sort of pond maintenance, I stick my nose into one of these sunny blooms and I’m rewarded with a fresh and fruity fragrance. There are usually several flowers blooming at any given time during our long growing season. 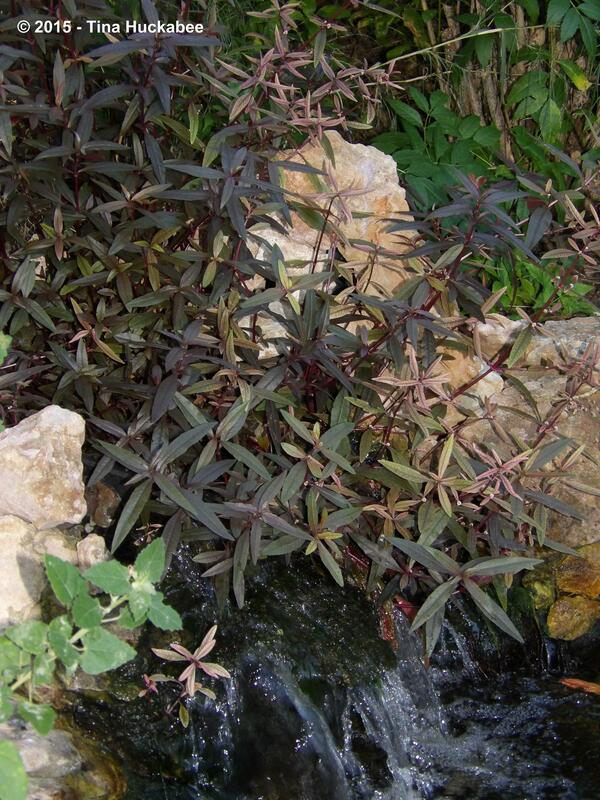 …and is cute, but it’s not what attracts the eye to this plant. That’s reserved for the beautiful foliage. What’s blooming in your garden this GBBD? Enjoy, share, and check out May Dreams Gardens to see July lovelies from other gardens! This entry was posted in Garden Bloggers' Bloom Day, GBBD and tagged 'Claude Ikins' Lily, Pickerel Rush, Pontederia cordata, Ruby Red Runner by Tina. Bookmark the permalink. Blooming in my veggie garden, lettuce, chicory, broccoli if I’d let it, string beans, flat beans, tomatoes, tomatilo and still a few blackberries show their pretty lavender, lavender, too, showing it’s lavender, dill, chamomile, oregano, garlic chive, all make it beautiful this summer. You have lots blooming, it sounds like. My blackberry blooms and fruit are long gone, though I froze quite a bunch–cobbler anyone? 🙂 Sadly, I’ve lost my one lavender. It grows here in Central Texas, but mine has lumbered along, pretty and nice smelling, but few blooms. It was gorgeous when we had our rains in May and June and then, up and died on me. So, yeah, I won’t replace it with another. I have some native Texas plants to put in instead. Enjoy yours, though!! Oh, yum. I love raspberries. And summer apples!! Actually, Texas apples come off in August and are quite good, though there’s a limited supply. I know the Central Texas peach crop has been quite good this year. Weirdly, I haven’t had any–I should fix that. Oooooh….just reading this post is a cooling experience. I bet if I had a pond I’d be guilty of needing to step in and stand in the water, just to “check on things”… Potentially several times a day in this, the hot season. Especially if there were fragrant water lilies to snuffle. Yup, I am officially deep into pond envy territory here. But I did need to shake that off long enough to comment on how especially stunning your photos are this go-round. So well done and under sweaty circumstances to boot! Hard to choose a favorite but that sunny shot of the pickerel rush is a current front runner. I love my pond!! I resisted for quite a while in building it, thinking that it would be too much work, but it’s very low maintenance and it’s so nice-year round, but especially during summer’s heat. I have another water-lily which is a fabulous bloomer, the Colorado, but for some odd reason, there are no blooms at the moment. Drat!! Sweaty circumstances, indeed! Let me tell you what it’s like when I check the honeybees…. 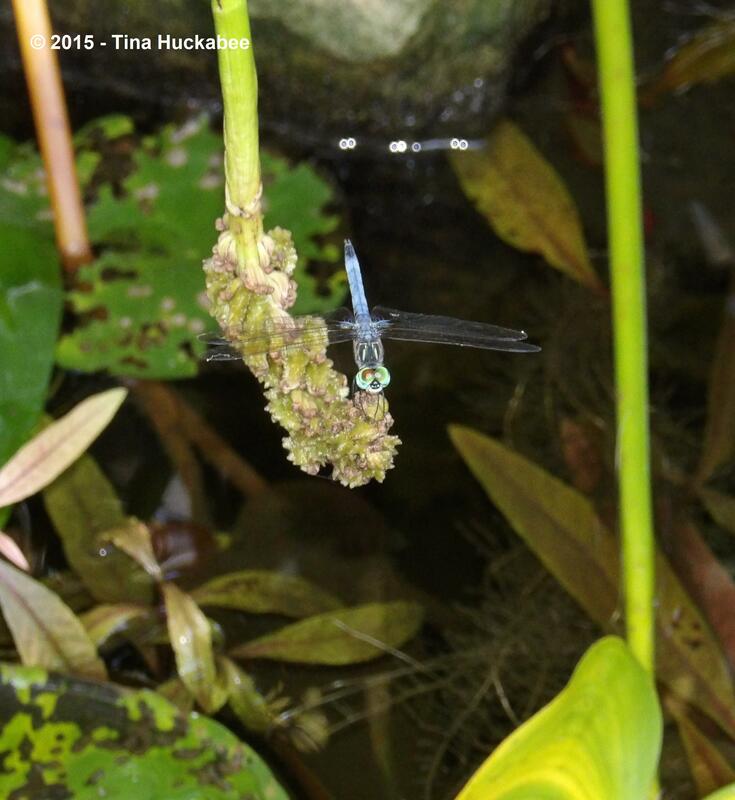 Great photo of the dragonfly! He posed very nicely for me! Happy blooms to you too, Lea. You might be surprised at how quickly the water plants grow and bloom, Gina. Enjoy! Lovely photos of your beautiful pond. What a superb water lily. You wade into your pond for maintenance? Well that would make a good photo. Ha! 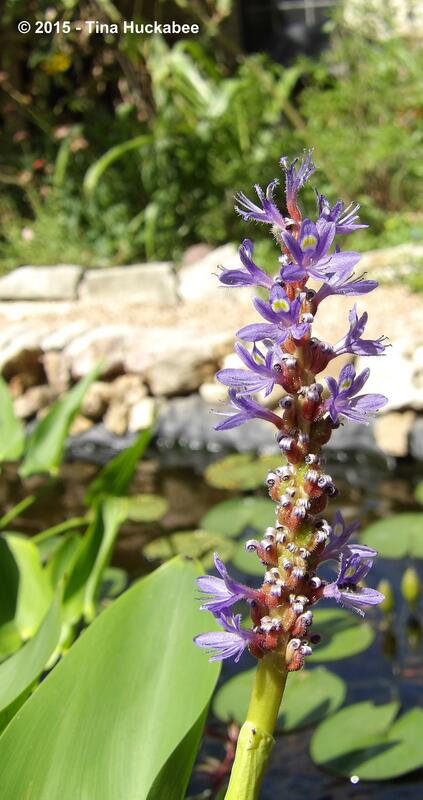 Actually, I have to get into the pond when I feed the waterlilies (once/month) and I also dead head the Pickerel Rush, and I can’t reach some of them from the outside of the pond. My standing in the pond gives the fish something new to consider–they nibble at my toes! Oh my … I’m swooning over the water lilies! I think it’s too cool and shady in my garden this year (so far, anyway). The water lily has shown no signs of blooming yet. Your Pickerel Rush is lovely, too. Pretty, eh? I’m sorry that the other water lily, a ‘Colorado’, isn’t currently blooming. It’s a deep pink with a yellow interior–they’re quite nice together. I guess your lilies will bloom soon? I’m with texasdeb – your post makes me want a water feature! Beautiful photos!! I think your post has just identified a mystery plant I have – alterneathera – although a different type. 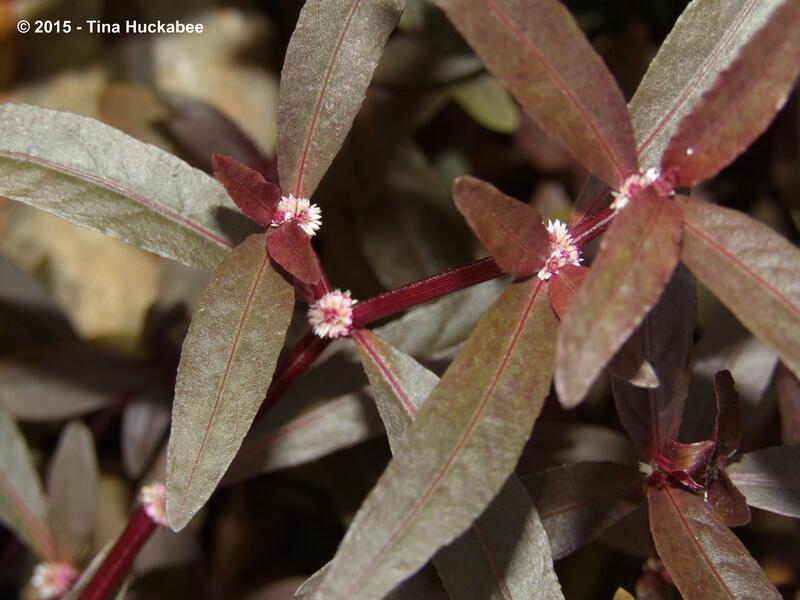 My Alteratether ficoidea has tons of small red leaves. Thanks. You’re welcome! Alternanthera seem to be a quite large group of plants. I don’t know much about them, though they seem more common in more northern ranges. I love mine. I bought and planted it because it’s filter plant for the pond, but it’s such a pretty addition to the pond and the garden in general. Just what like: useful and gorgeous. Win!! 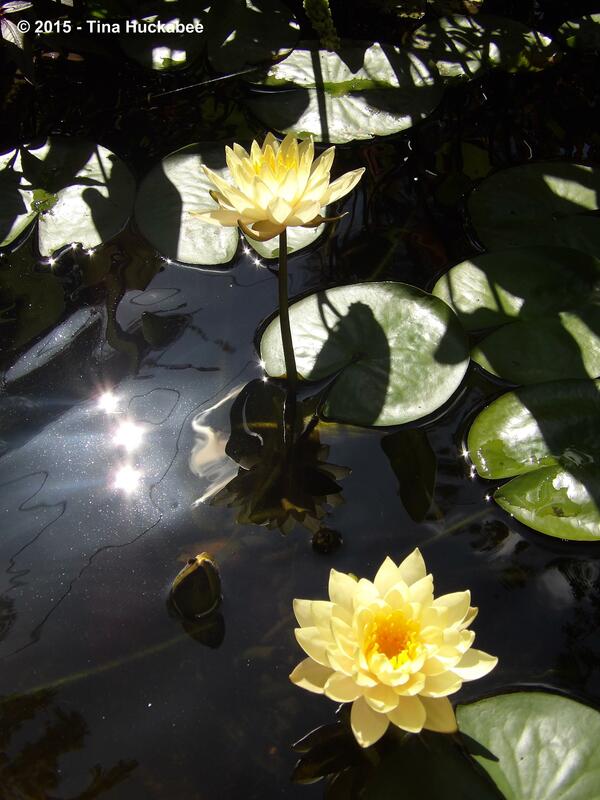 Gorgeous water lilies! Always makes me think of a Monet… and it is no wonder he focused so many works on the subject – they are so exquisite! They are beautiful and luscious, especially in our summers. Monet was definitely onto something, eh?